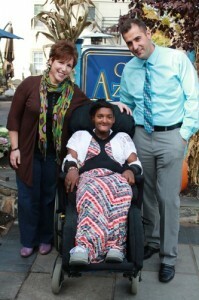 From left, Arts Access director Eileen Murray; Matheny adult patient Rasheedah Mahali; and Café Azzurro owner/chef Beni Mavraj. Café Azzurro, located on Main Street in Peapack, NJ, is the newest food sponsor for Full Circle 2012: Unexpected Art, the annual celebration of Matheny’s Arts Access Program, which enables people with disabilities to create fine art, assisted by professional artist-facilitators. The northern Italian restaurant joins cocoLuxe fine pastries, Peapack; Gladstone Tavern, Gladstone; 3 West, Basking Ridge; and Village Office Supply, Somerset, all of whom have provided food and beverages at past Full Circles. Full Circle will be held from 3-6 p.m., Saturday, November 3, in the Robert Schonhorn Arts Center at Matheny. For more information or to order tickets, call (908) 234-0011, ext. 260, or email pcats@matheny.org. This entry was posted in Uncategorized and tagged Café Azzurro, Full Circle 2012. Bookmark the permalink.